Is This What the Samsung Galaxy 4 Could Look Like? Although Samsung hasn’t officially said anything so far, there’s no doubt that the Galaxy S IV is currently in development – most likely the final stages of development. Rumors about the device are found across the internet, but one site decided to take rumors a step further by creating its own promotional video for the GS4. As you can see, the GS4 mockup contains an edge to edge display, which means that there is no bezel along the left and right sides of the device. The resolution is also expected to be full HD 1080p. 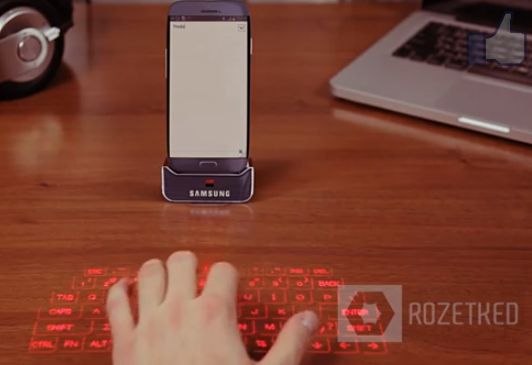 But the coolest feature of that video is undoubtedly the projected keyboard function, which lights up a keyboard on any surface and allows users to type out their message without actually pressing any keys. This is futuristic technology at its finest, and it would make typing out long emails a whole lot easier – and portable – than ever before. Along with the sleek curves of the device and the classic Samsung home button at the bottom, the GS4 looks a lot like the GS3, which isn’t necessarily a bad thing. My prediction is that the actual Galaxy S IV will blow this concept out of the water, but who knows? What do you think – will the real S4 look better than this concept video? Or will it look worse? Let us know in the comments section below!